Photo Credit: The Rooms Provincial Archives: A 66-145; Guglielmo Marconi, with instruments used to receive first transatlantic message,St. John’s. Photographer James Vey, St. John’s. 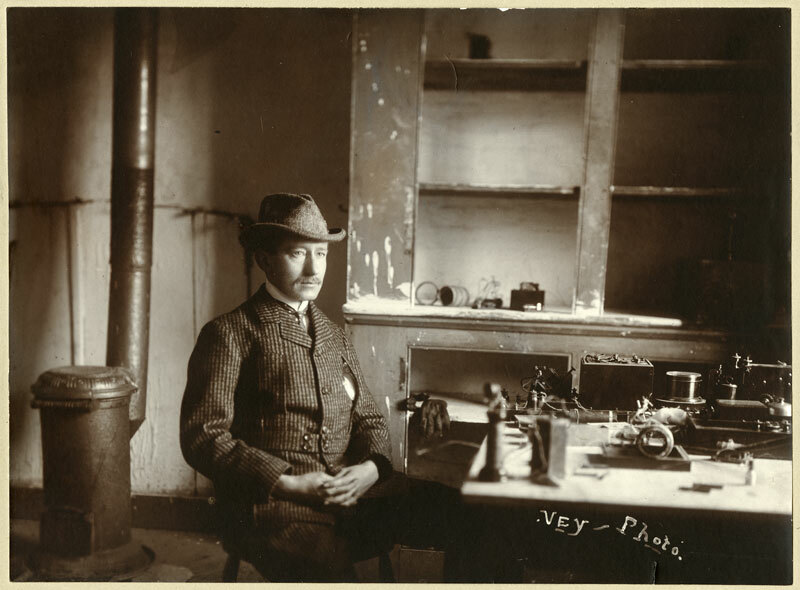 On December 12, 1901, at Signal Hill, St. John’s, Italian scientist and engineer Guglielmo Marconi sent and received the first transatlantic radio message. The test signal was sent by electrical engineer John Ambrose Fleming in Poldhu, Cornwall, 3,200 km away across the Atlantic Ocean. It came in through a 121 metre long copper wire antenna trailing from a box kite and out through a radio speaker. Marconi had set up temporary masts, but high winds had blown them down. The kite contraption worked. Marconi heard the first signal as the faint clicking of Morse code – of the letter ‘S’ –three short clicks– repeated over and over, and he passed the ear piece to his assistant, G. S. Kemp for corroboration. Marconi first started experimenting with radiotelegraphy around 1895 and he realized that messages could be transmitted over much greater distances by using grounded antennae on the radio transmitter and receiver. A few years after his successful transmission with Fleming, Marconi opened the first commercial wireless telegraph service. Recommended Reading: Marconi, by Giancarlo Masini, Marsilio Publishers: 1999. This entry was posted in Archival Moments and tagged Cornwall, Fleming, Marconi, Poldhu, Signal Hill on December 11, 2018 by Larry Dohey. The New Palace – One of Several Buildings in Newfoundland by Internationally Celebrated Architects. The Palace, St. John’s, NL under construction in 1923. The article was referring to the new home for the Catholic Archbishop of St. John’s, Edward Patrick Roche and the priests on the staff of the Roman Catholic Cathedral of St. John the Baptist (now Basilica). They moved into their new home on December 14, 1924. The new home referred to locally as “The New Palace” replaced the “Old Palace’ that burned to the ground in 1921. Palace was the name given to the official residence of a Catholic bishop. The Palace located at 200 Military Road, on the corner of Military Road and Bonaventure Avenue, (across the street from The Rooms) is now the home of the Offices of the Archdiocese of St. John’s and is officially known as the Archdiocesan Pastoral Centre. Although it was the official residence, Archbishop Roche never did live in the Palace. He opted to make his home at Beaconsfield located on Topsail Road. He commuted by car to the Palace every day. The firm of Delano & Aldrich were no strangers to Newfoundland and occupied a central place in the United States in the first half of the twentieth century, substantially shaping the architectural climate of the period. The grand country estates, striking townhouses and club buildings, churches, schools, and public buildings designed by William Adams Delano (1874–1960) and Chester Holmes Aldrich (1871–1940) are exceptional examples of architectural creativity and originality. The New York Firm designed the American Embassy in Paris, France in 1929; construction began in 1931 and was completed in 1932. The Chancery of the Embassy is remarkably similar to the St. John’s, Palace. It has been suggested that the American Embassy in Parish is a larger scale version of the Palace in St. John’s. Archbishop Roche became quite good friends with Delano joining him for lunch at the prestigious Knickerbocker Club in New York whenever he visited. The Club was designed by Delano and Aldrich and was considered one of the bastions of old-world society. View of front facade and right side, King George V Building, 93 Water Street, St. John’s. William Adams Delano was quite familiar with Newfoundland. He was a board member for the International Grenfell Association (IGA) and was responsible for donating a number of designs for several hospitals and orphanages to that organization. In St. John’s two of his most recognized designs are St. Clare’s Mercy Hospital (1938-1939) LeMarchant Road and King George V Building,Water Street, erected in 1911. Recommended Archival Collection: Archives of the R.C. Archdiocese, St. John’s . The Delano and Aldrich archive is held by the Drawings and Archives Department in the Avery Architectural and Fine Arts Library at ColumbiaUniversity. This entry was posted in Archival Moments and tagged basilica, Beaconsfield, Delano and Aldrich, Grenfell, King George V Building, quarry, Signal Hill, St. Clares Mercy Hospital, The Palace, The Rooms on December 12, 2012 by Larry Dohey. On December 12, 1901, at the Signal Hill, St. John’s, Italian scientist and engineer Guglielmo Marconi sent and received the first transatlantic radio message. The test signal was sent by electrical engineer John Ambrose Fleming in Poldhu,Cornwall, 3,200 km away across theAtlantic Ocean. It came in through a 121 metre long copper wire antenna trailing from a box kite and out through a radio speaker. This entry was posted in Archival Moments and tagged Cornwall, Fleming, Marconi, Poldhu, Signal Hill on December 11, 2012 by Larry Dohey.